Don’t you just love it when a meal comes together? After a recent cooking experience, featured in the Not Every Hit Is A Home Run post, I was ready to make something we could actually eat. Thumbing through Bon Appetit before bed the other night, I thought the One-Skillet Wonders of Chorizo and White Bean Stew would be just what the doctor ordered. Eddie glanced over my shoulder, “Yum, you should make that!” he said, and went back to looking at The Chive. This stew is impossibly simple and so hearty, as it’s basically just big chunks of sausage. I’m medium on chorizo so I used Italian sausage instead, and discovered Whole Foods actually makes their own – which I recommend. I found it very flavorful without being too fatty or salty. 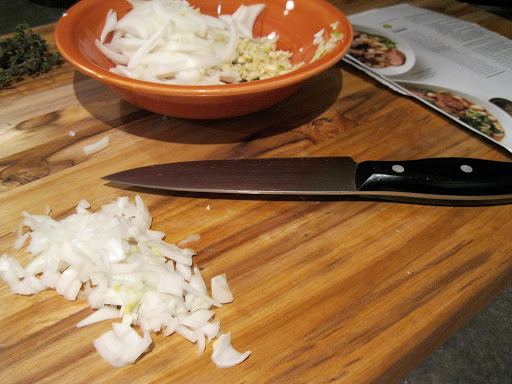 I used a homemade vegetable stock I had in the freezer (ideal) but use something low-sodium if you go store bought. Finally, after organizing my spice selection this month, I have two mystery jars left of red, smokey, spicy powder. I believe they are somewhere along the lines of chipotle, chili pepper and/or smoked paprika – but for the life of me I can’t decipher which is which. I continue to revisit this situation, tasting and smelling them. I analyze, infer, screw the caps back on and skip their usage. For the recipe, I engaged in this spice ritual, then withdrew smoked paprika from the cooking process and went an Italian route, utilizing only thyme. If you use chorizo (Whole Foods also makes these in-house), I’d recommend a smoked paprika to round out and deepen the flavors. Maybe your spice selection is more clear than mine. Foodie Note: The recipe calls for 5 oz (about 10 cups) baby spinach. 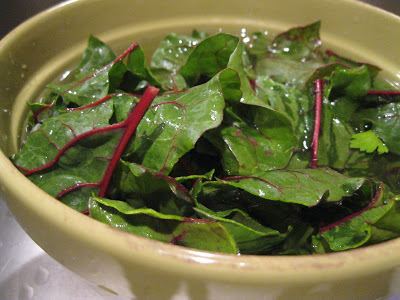 Whole Foods was full-on out of fresh spinach last Sunday, so I subbed a bundle of red chard and it was wonderful. I wrote this recipe with the chard variation but if you use spinach, stir it in right before serving. Serves 4: If you can’t find fresh chorizo, use any fresh sausage. Heat olive oil in a large skillet or dutch oven over medium heat. 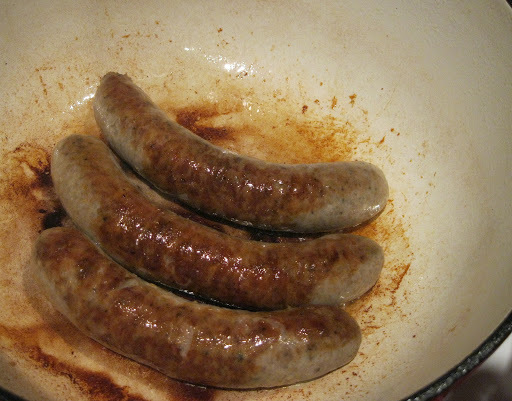 Add sausage and cook, turning occasionally, until browned and cooked through, 15-20 minutes. Transfer sausage to a plate. Turn up heat to medium high, add chard and saute for 5 minutes. 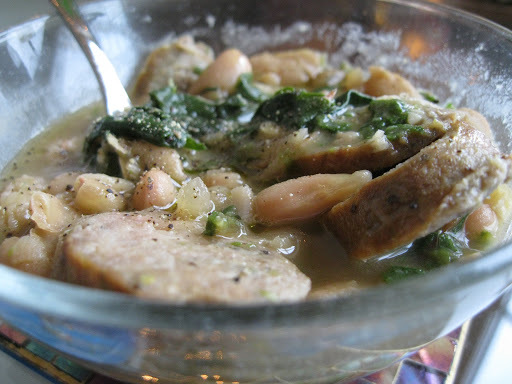 Slice sausage into 1/2″ pieces and fold into stew; add water to thin if desired. Divide stew among bowls; drizzle with good olive oil and sprinkle with fresh cracked pepper, thyme or smoked paprika (if desired). This looks wonderful! Hearty, filling and delicious. I am with you on the Italian sausage vs. chorizo. I like chorizo but sometimes it overpowers the other ingredients.StacyP.S. Thanks for your kind comment on my site. I got an email so I know what you posted but Disqus has decided it was spam since you put your link n the comment box. So it doesn't show up. Sorry about that!